check out our "trimlight" tab permanent smart phone controlled led lighting for your home... great for any holiday/occasion & increased home security. enjoy your new outdoor space all summer!! NOW BOOKING FOR spring 2019! SERVING LEDUC, BEAUMONT, DEVON EDMONTON, & ACREAGES IN SURROUNDING AREAS. Do you need a new fire pit to kick back around? Did you just move in and need some help designing your yard? We work with you step by step to make sure we bring your vision to life and keep you in the know every step of the way. BOOK A PROFESSIONAL CONSULTATION TODAY! 1 Design a flowing pattern. 2 Install Cobblestone and Premium Landscaping Fabric. 3. Finish with Rundle Crush Rock and a few trees & shrubs. 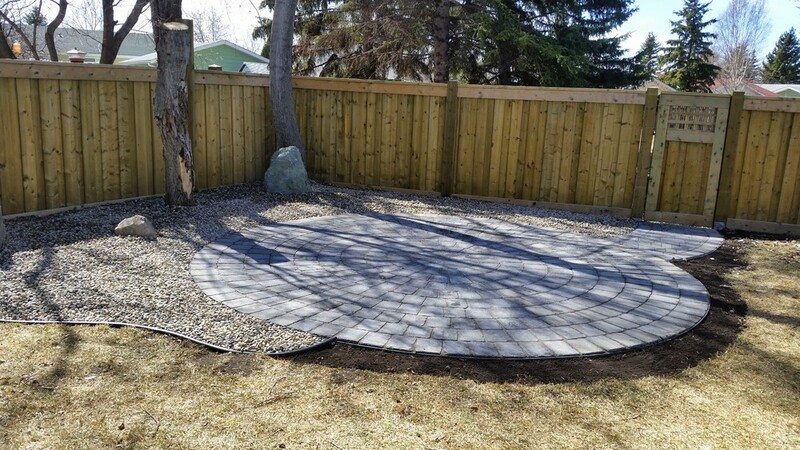 We do all types of brick installation, from brick patios to circle pad. We can install retaining walls to help with any grading issues you may have. Even if you are just looking for a simple planting bed to start a new a new garden. Anything you've seen or can think of, we can put in your yard. We can also beautify your space using greenery, we will put in plants in a way that they will grow together and make your yard look like a brand new space. We can do anything from smaller flowers to spruce up your front yard, or install tree lines to give you privacy from your neighbors well you enjoy that backyard BBQ.